For those who are interested, the online competition for the 2012 KPOP Cover Dance Festival is still open until the end of the month. Hurry if you want to have the chance to perform at the Kpop Cover Dance Festival in Gyeongju on September 21st. You could also have the chance to meet your favorite KPOP idols. There are currently 48 videos from the Philippines. The winners of the online competition will take part in the local competition (country). The local competition winners will take part in the finals by region. 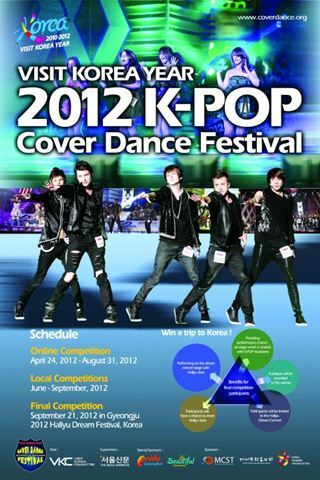 You can find more information about the 2012 Kpop Cover Dance Festival from their official website. Good luck to those who are joining. Hopefully, the winner will come from the Philippines! Don’t forget to vote for the entries from the Philippines so they could win the online competition.